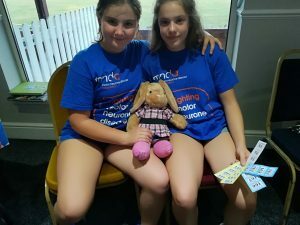 Guess the name of the rabbit was just one of several great fundraising ideas used during the annual Nantwich Strawberries and Cream evening, held in memory of close family members who had been previous victims of MND. It was especially poignant this year, as Joan Park, a tireless fundraiser on behalf of Cheshire branch MNDA sadly passed away recently. So, the ladies involved wanted the event to continue in exactly the same way as if Joan herself was at the centre of the preparations. And that’s exactly what they did. Nantwich Cricket club again provided the venue on a warm evening in late June and over 70 guests duly came to enjoy themselves. Bowls of strawberries and cream were served, always a treat! Then guests were invited to purchase raffle tickets with a highly desirable range of prizes, mostly donated by local shops and businesses. There was an auction which attracted a lot of interest and soon, bids were coming in thick and fast! Those who felt lucky could also pick a cork to win a bottle! Items of jewellery and accessories were also on sale. There was a great atmosphere with a real buzz in the room and no one seemed in a hurry to go. The organisers were delighted at the end of the night to find that they had raised £1800 to help local people living with MND and their carers and also to fund vital research into this cruel disease. The evening wouldn’t have been such a great success without generous donations, prizes and auction items from businesses in Nantwich and surrounding area. Their support is always, invaluable. Those ladies who put in so much hard work to make the evening such a success were justifiably proud of their achievement. A great night all round! And the rabbit’s name?